What does this mean for the euro? Any rally should be seen as an opportunity to sell at a higher level. The big story in the financial market today is Portugal -- the next domino expected to fall. According to a poll conducted by Reuters, 85% of dealers expect Portugal to receive a bailout. Portuguese credit default swap spreads have increased to a record high of 548bp which is the same level that Irish CDS spreads widened to before the government was forced to initiate bailout negotiations. Over the weekend, Die Spiegel, a leading German newspaper reported that Germany and France were pressing Portugal to accept a rescue package. The Portuguese government denied a need for a bailout as recently as Sunday but having gone through this twice in the past 12 months, we know that denials is the first step towards acceptance. Both Greece and Ireland vehemently denied the need for a bailout before they were eventually forced into accepting one. Portugal’s 10 year bond yield surged above 7 percent, which means that the borrowing cost is still sustainable but barely so. Some investors expect Portugal to ask for a bailout as early as Wednesday when they have a bond auction scheduled but the greater likelihood is that they will wait until after the auction is held. Their next T-bill redemption is scheduled for Jan 21, 2 days after the Eurogroup / Ecofin finance minister meeting -- which is a good platform to discuss Portugal’s situation. Although Portugal only represents a small percentage of total Eurozone GDP, its problems have sparked concerns about the credit worthiness of Spain, a country that accounts for more than 10 percent of the euro area’s GDP. The market could cope with a bailout of Portugal but not a bailout of Spain. With no end in sight to the European sovereign debt troubles, things will certainly worsen before they improve. Spain also has a bond auction on Thursday -- we don’t expect demand at the two auctions to be exceptionally weak, but that will not stop investors from turning on Portugal. 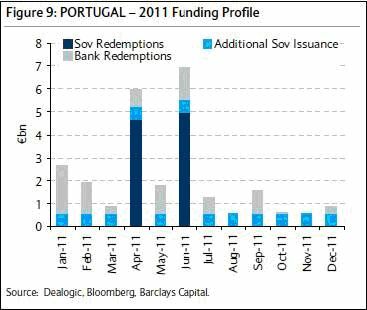 As indicated in the chart from Barclays below, the Portuguese redemption schedule is VERY heavy in April and June which means the country needs to raise money to meet those redemptions -- if the liquidity crisis intensifies, their only option could be a bailout.